What put the Concept 30 Sport Deck’s top speed into context for me was the realisation that it was the same as my old Beetle managed in its youth – 65 knots or 75 mph. Still, the Beetle did it with 50hp instead of the Concept’s 600. It didn’t sound so good though, and I definitely didn’t feel so cool driving it. 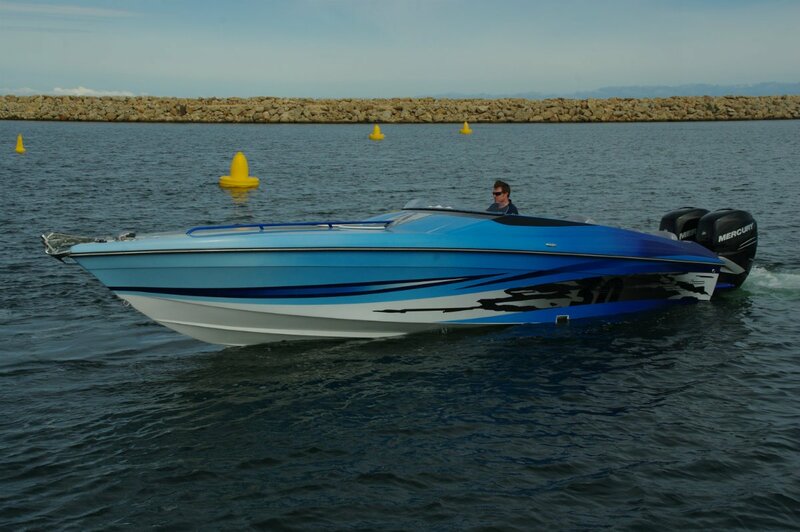 Fast and cool are two of the key features of this boat, although it has touches of the practical its centre console sister manages without. 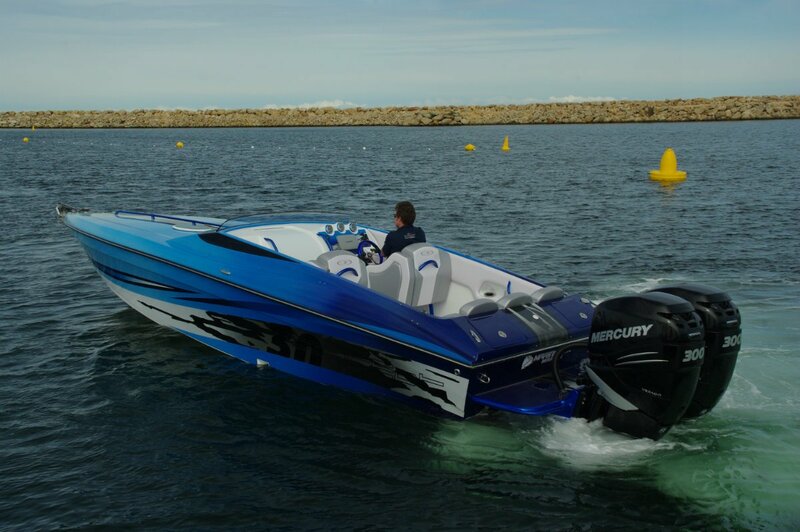 Either model will give you ten minute trips to Thompson Bay, but the Sport Deck’s possession of an electric flush toilet plus holding tank might reduce the need for maximum speed dashes. Under its long foredeck the Concept provides the means for a couple to overnight in acceptable comfort. There is a pair of long bunks, seats, an icebox and a separate toilet compartment. There is not a lot of headroom, so using these facilities is better left for the young and flexible – who are the likely buyers anyway. Although a good share of length is given up to an only occasionally used space, it is a part of the length you would prefer not to inhabit at 65 knots. The cockpit is located in the lower motion and more spacious area, with seating for five on the luxurious side of comfortable. 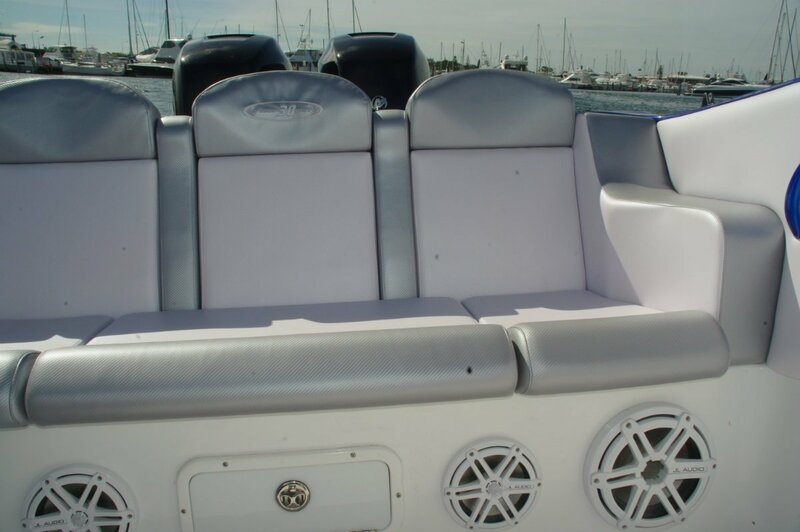 Importantly, the seats’ resilience is nicely balanced to cope with both high speed thrills and lounging at anchor. In the Concept’s homeland, the USA, very little anchoring is done by any boat, resulting in the primitive arrangements most imports have. Catering for WA conditions, the importer fits a power windlass, which makes particularly good sense when you view the distance between the bow and the habitable part of the boat. The beam of 2.4 metres is narrow for a nine-plus metre boat, but this is a sacrifice to a high speed hull. It means a cockpit for sitting in rather than wandering around in, but plenty of leg room is provided, illuminated drink holders are wherever a hand is likely to drop, and the sound system would not disgrace a night club. This boat is still cool at zero knots. But much more fun at plenty of knots, and designed to cope with them. The driving position gives a secure feeling, either on the bolsters or in the seats, and the key controls are in exactly the right position. 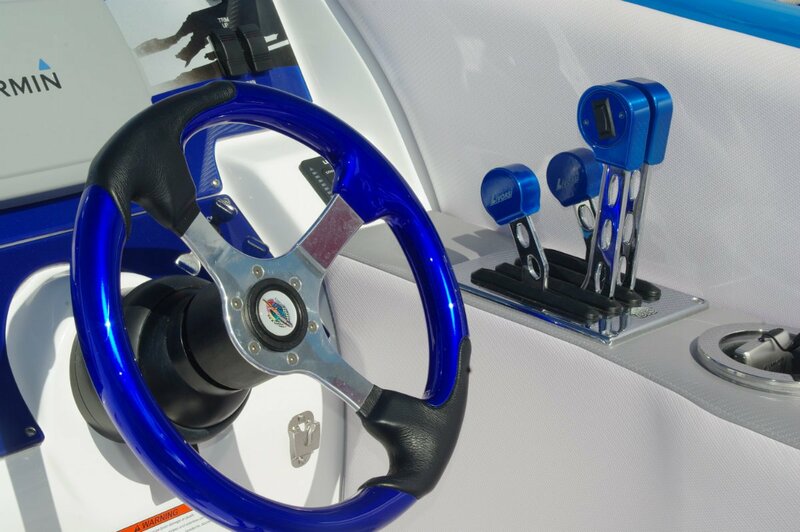 The two Verados have been given twin lever controls – always the safer option on a high performance craft – and these are top class race boat components. 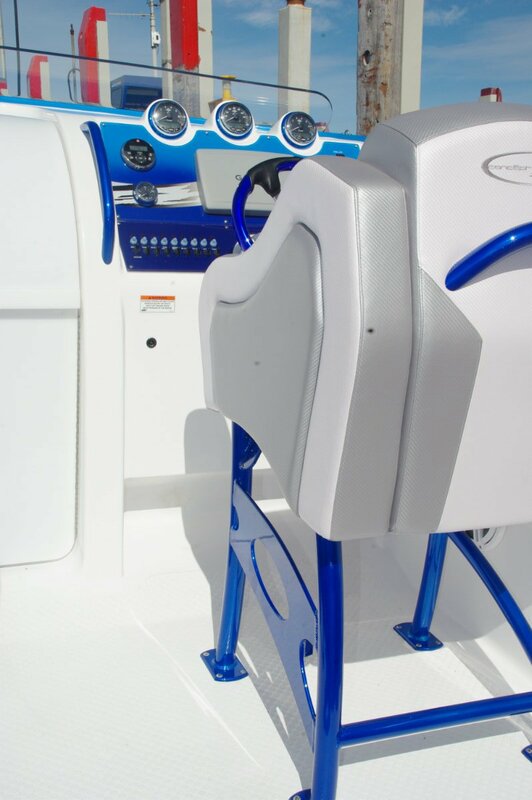 The trim tabs too are super heavy duty items intended for high speed work. 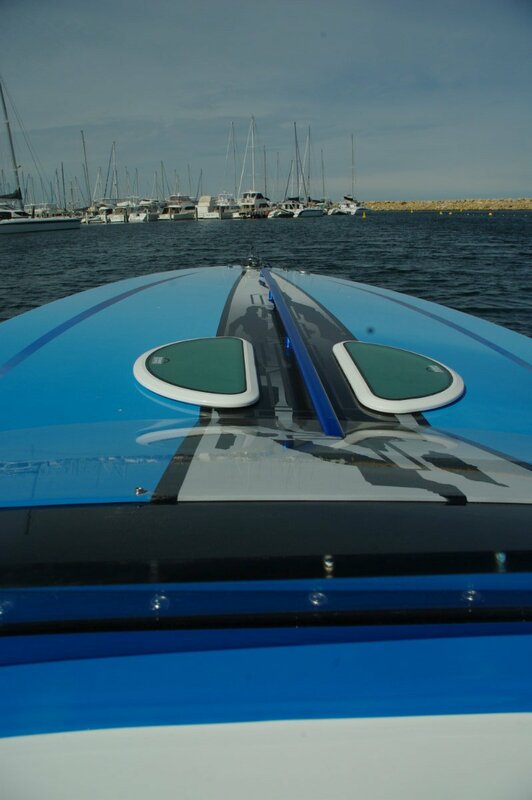 The sea conditions laid on for us were the sort of corrugations to encourage the average trailer boat to drop its cruising speed to say 18 knots from the usual 22. Not rough but capable of delivering jolting progress. Heading straight into the sea we played with throttle and trim and found that 34 knots gave us a practically calm sea ride. Full throttle into it took us a little beyond my comfort zone – which has a pretty low threshold nowadays – but heading off a touch and taking the sea on the shoulder smoothed it all out. An impressive performance. Our Concept had been fitted out with every conceivable option and extra. Air brushed artwork, upgraded stereo, triple batteries and charger, underwater lights and plenty more. The price of $199,000 reflects this, but for the base price of $149,000 you still get a well fitted boat. This is a thoroughly established design with all the details long sorted out: things like the convenient location of main switches, access to wiring and auxiliaries, elasticised net over side pockets, clever storage locations. An impressive performer.